THE captain of Henley Cricket Club says he is targeting success on and off the pitch this season. Ahead of tomorrow’s (Saturday) season opener at home to Banbury, Michael Roberts, who is leading the Brakspear Ground side for the fourth year, says he is targeting another league and Twenty20 double this year. But he also wants to see more players get involved with the sport at all levels of the club. The first team, who finished second in the league for two consecutive campaigns, roared back to win the Home Counties Premier League Division 1 last season, adding to their T20 Trophy earlier in the year and repeating the double achieved back in 2014. Batsman Roberts says he wants more success, with the firsts also competing in one-day national competitions, and hopes the club’s other teams can perform equally well. He said: “We had a really good year in 2017 and beyond winning the championship and the T20 the club as a whole came forward. “It was great to see the second team stay up in an extremely competitive league, only two below where we are. The thirds also got promoted. “The first team performed really well and I’m most happy that we responded so well to the 2016 season and learned from that. The season has not begun with the best preparation as all three warm-up games have been called off due to bad weather. But Roberts says the training has been good and he is confident of a good start. He said: “It’s not ideal but it’s been the same for most teams, that’s how it goes in cricket. “A couple of years ago we were in the same position and when the first game came we were brilliant. Last year we had a full pre-season and we started poorly. Henley have also lost several key players from last season. Wicket keeper Stewart Davison has moved to Finchley to become director of cricket, while bowler Waqas Hussain has left the area and joined East Anglian club Swardeston. The club have brought in Andrew Rishton, a former Finchampstead player who played for Loughborough Town last season and made his first class debut for Loughborough MCCU against Sussex at Hove this month while youngster Mike Williams will replace Davison as wicket keeper. Roberts said: “There have been a few changes with Stewie Davison taking a good opportunity at Finchley and Matt Rowe coming in as head coach. “Waqas also moved for off-field reasons and we wish him the best of luck, he’s a great kid. “We’ve lost a few players but made some good signings. counties so he’s a very good player. Mike Williams is one of the biggest young talents and is training with Middlesex. “We think he will be pushing for a place in their academy and doing his apprenticeship with us. Roberts is hoping the new players will gel as they take on Banbury, who finished fourth last year. The visitors have signed batsman Qaasim Adams from Cape Town as an overseas player, while skipper Lloyd Sabin was last season’s top scorer with 847 league runs. Roberts said: “The proof will be when we go out. “Banbury are led very well by Lloyd and have been very clever with their signings. While the first team is flourishing, Roberts also wants to see success elsewhere in the club. 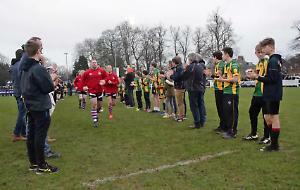 The fourth team folded last year due to lack of players but he says they are hoping to have it back for the 2019 season, possibly with the help of the Sunday team. He said: “We won’t be the only club in the country that is struggling. With availability issues and younger kids having other avenues they want to go down all of a sudden there isn’t the depth we are used to. Roberts also wants to see more locals join the club. He says while many youngsters pursue other hobbies now, he also thinks the success Henley have enjoyed could be putting people off. He said: “It can be quite a performance-oriented club and that can seem quite daunting but when people get stuck in they find it’s professional in the areas you want it to be and amateur in the areas you want it to be. Henley face Banbury at the Brakspear Ground from 11.30am tomorrow (Saturday).